The USDA's Dietary Guidelines recommend children and adults eat anywhere from 5 to 13 servings of fruits and vegetables per day… that’s a whole lot of salad! But, this doesn’t mean your diet has to be bland and boring! Instead of the classic cole slaw...try this fresh take from the great folks over at Hungry Girl. Personally, I think it's the perfect refreshing treat! 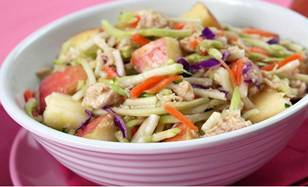 In a medium bowl, mix coleslaw, apple and tuna. Top with dressing and toss to coat. Enjoy! Disclosure: This is a guest post recipe from Hungry Girl. I love salads that combine protein, fruit and vegetables as this one indicates. The low fat ginger sesame dressing adds that Asian flair that makes the salad even better.